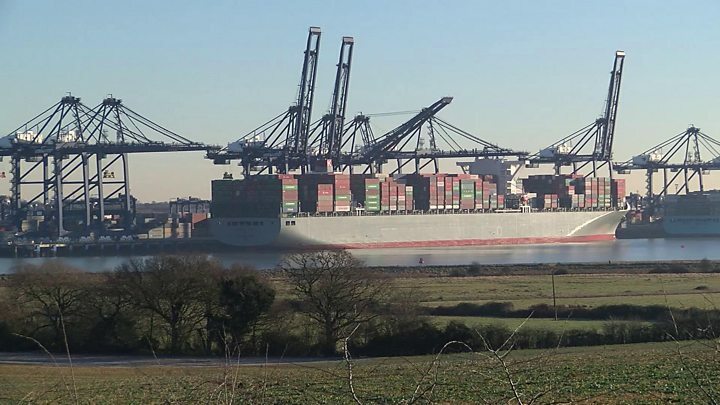 A person has died in what has been described as an "explosion" on board a ship at the Port of Felixstowe. One person was killed and another taken to hospital after the apparent blast in the Manhattan Bridge's boiler room. The Japanese ship was docking at the Trinity Terminal just before midnight. Suffolk Police said the death was not being treated as suspicious. The ship's owner said a "boiler back-fire" occurred while the vessel was berthing at 23:05 GMT on Thursday. "'K' Line (Europe) and all within the organization wish to express their condolences to the family of the deceased and their sympathy with the crew of the vessel," a spokesman said. There will be a joint investigation between the police and the Maritime and Coastguard Agency. On the port's website, the Manhattan Bridge is reported last docking at Rotterdam and was due to head to Hamburg. A port spokesman said the incident took place when the ship was not alongside the port, so the incident did not fall under the port's jurisdiction. Suffolk Police is leading the investigation and remain at the scene. The port has not yet said if it will launch its own investigation. "K" Line (Europe) said Marine Accident & Investigation Branch (MAIB) representatives were due to investigate the cause of the incident. People who live nearby described hearing a loud explosion unlike anything they had heard before. Baz O'Connell lives in Shotley, opposite the Port of Felixstowe, and works at the marina there. "There was just a very loud bang. You hear noises all the time where they drop containers but this was a much louder noise than normal," he said. "I live in a caravan opposite the docks so it woke me up." Gary Richens, who also lives nearby, said he also heard the explosion. "I'd been at a parish council meeting, and was watching TV when I got back when I heard a really different low boom," he said. "I looked over at the port of Harwich, as that's the time when the Stena Line service leaves, but everything looked in order. "It was a very definite low boom that was different to any other noise I'd heard."